From the iconic Colt collection, this handsome Breitling Men's Colt 41 Blue Strap Watch, combines high performance with style. This Swiss-made timepiece boasts a sturdy steel case water-resistant to 200 m (660 ft) with an officially chronometer-certified self-winding caliber. The four rider tabs equipping the satin-brushed bezel guarantee effortless handling as well as optimal protection of the sapphire crystal glareproofed on both sides. 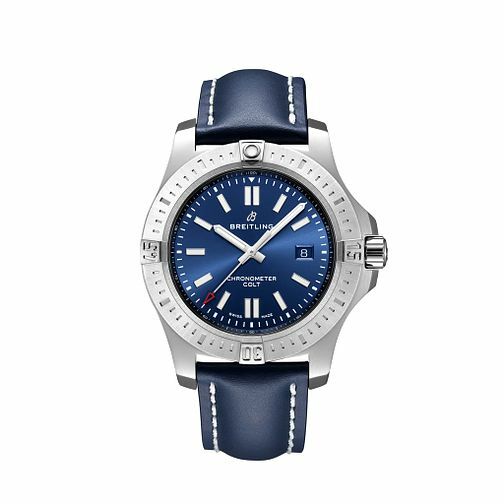 Finished with sleek genuine leather blue straps to give it that final touch of style.